Did you know that both Harry Potter and Dr Who have lived in Marden? The actor William Hartnell, the very first Doctor Who, lived with his wife Heather at Cornwells, Sheephurst Lane and died here in 1975. 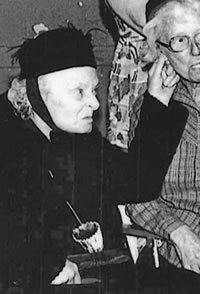 It is Heather Hartnell, the actress Heather MacIntyre, who is pictured here acting in a scene from a Marden Women’s Institute play in 1982. And as for Harry Potter, he was a local nurseryman in the 1930’s. Now let us look at the Russian princess, Natasha, who lived in the Jewell House, and her connection with Rasputin! We can also count as notable Mardonians those who have served the village and its community. See John Hall, farmer, talk about mowing the Churchyard for the last 30 years.